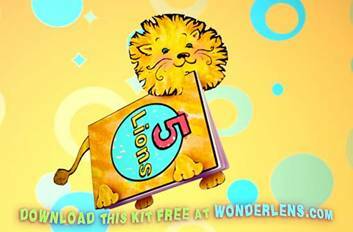 A Wonderlens FREE Activity Kit! Here’s a Book about Lions…that IS a Lion! Just Print, Cut, Fold & Color. Attach the Lion’s Head, Tail and Feet with glue or tape. Also makes a great classroom activity! Download the 2-page kit and 1-page instructions below.